Each year, the run-up to the French Open tennis tournament sees the Swiss watchmaker unveil a new high-performance timepiece celebrating its long-running partnership with Spanish player Rafael Nadal. This year sees the arrival of a new watch, called the “RM 35-02,” which is the first model in Richard Mille’s collection dedicated to the Majorcan personality to use an automatic movement. Six years of collaboration have given rise to many exceptional creations, presented as part of the brand’s “Rafael Nadal” collection. Over the years, the tennis player and the watchmaker have worked hand in hand to create innovative wristwatches, notably in terms of their lightweight designs and shock resistance — two essential qualities for surviving Rafael Nadal’s forehand. Like its predecessors, the “RM 35-02” brings its share of technical and aesthetic innovations, starting with the new RMAL1 caliber, a self-winding skeleton movement with hours, minutes and seconds functions, and a first for a watch in Richard Mille’s “Rafael Nadal” collection. The “RM 35-02” boasts a baseplate and bridges made from wet sandblasted grade-five titanium with a black PVD finish, ensuring rigidity and impeccably smooth surfaces. Another key feature is the introduction of a variable inertia balance wheel driven by a double-barrel system. As well as improving the watch’s performances, this helps boost precision and reliability in case of shocks. Richard Mille has also brought its variable geometry rotor to the “RM 35-02.” This brand-exclusive feature allows the automatic winding to be adjusted to suit the wearer’s level of activity. The “RM 35-02” watchcase is waterproof to 50 metres and comes in a choice of NTPT Carbon or bright red Quartz-TPT with white highlights. 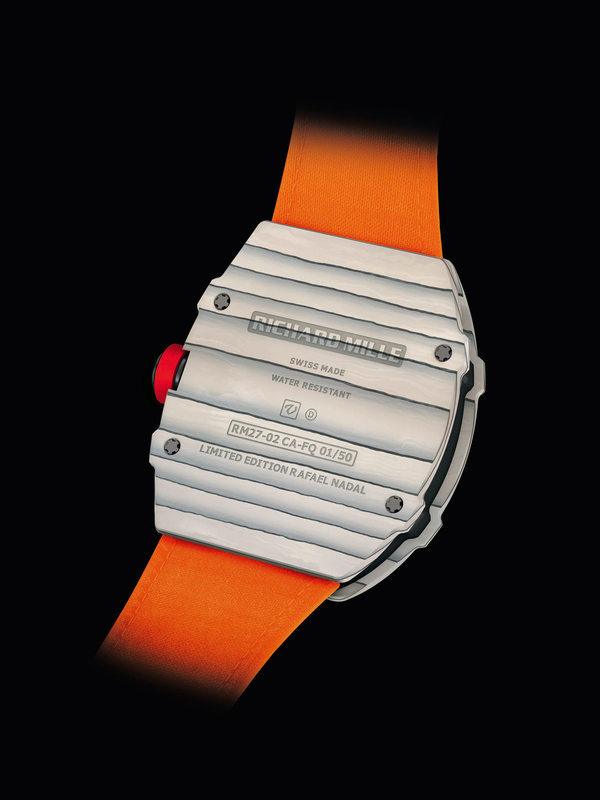 Its silicon layers are treated with a red resin specially created for Richard Mille. Another first for the Swiss watchmaker sees sapphire crystal with an anti-reflective finish used for both the watch front and its exhibition caseback, so the movement can be admired from any angle. 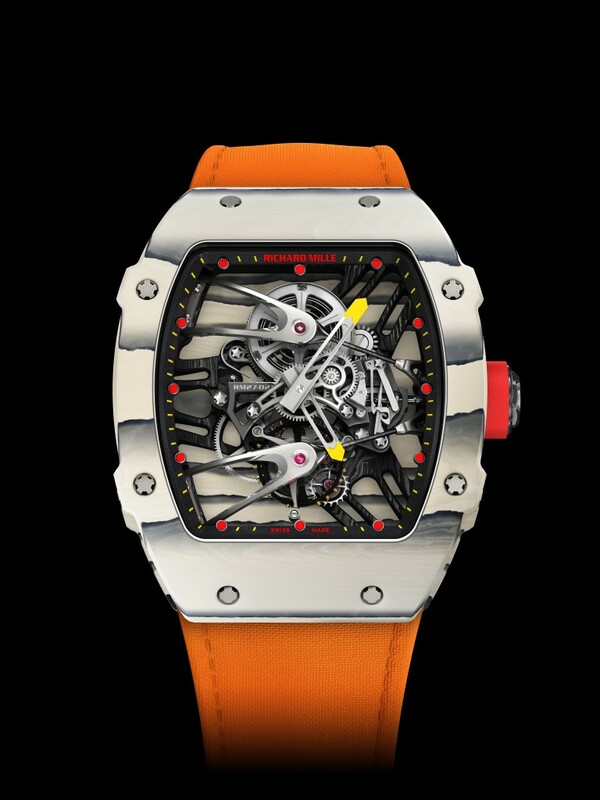 Previous standout models in the Richard Mille “Rafael Nadal” collection include the “RM 027” with a carbon nanotube case, the “RM 27-01” with a cable-suspended movement, and the more recent “RM 27-02” with its NTPT Carbon “unibody” baseplate.